The film starts with a man (Gian Maria Volonte) entering the apart ment of a woman (Florinda Bolkan) with whom he is having an affair. She utters the odd phrase, “How will you kill me this time?” Shortly thereafter, he does actually kill her, then takes a shower and proceeds to specifically leave evidence all over the apartment, including putting a thread from his tie under one of her fingernails and putting fingerprints on everything. It’s not too long after this that we discover that the man is not merely a cop but the former head of the homicide division in his city who has just been promoted. The woman in question, Augusta Terzi, is someone with whom he has had a long affair, and with whom he stages murder scenes, taking amateur photographs of her body in the position he has found corpses. What follows is not so much a ruse or even a cat-and-mouse game, but a lesson that the homicide cop is trying to demonstrate. Now that he has such tremendous authority, nothing he does will fall under scrutiny and he can literally get away with anything he wants. He continues to leave clues everywhere, offering assistance to the investigating police, offering his necktie as evidence, and even admitting to the affair. He quickly exonerates suspects, knowing that they are innocent. Eventually, he even offers a full confession, showing all of the incriminating evidence that would allow for a quick conclusion of guilt. All of this is clearly the point of the film. The former homicide head (he’s never named that I can remember) is, because of his position and influence, above suspicion for the actual crime that he legitimately committed (hence the name of the film). His intent on committing the crime is to demonstrate that at least to himself. There is some indication in places that he wants to indicate that reality to others as well, but of course he can’t. The entire paradox of what he is doing is that if he proves himself correct, no one will believe him and if people believe him, it will prove his hypothesis incorrect. 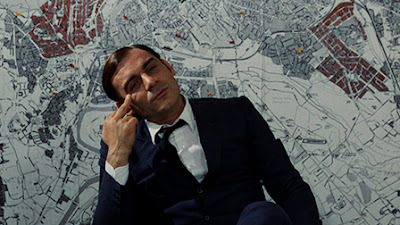 Investigation of a Citizen Above Suspicion is classified as a drama, and it is one in many respects. It’s also very clearly a dark comedy, though. The score indicates this if nothing else does. Truthfully, the score, replete with bouncy recurring themes and the liberal use of a mouth harp, quickly becomes annoying. But there is plenty of comedy here, or at least moments of complete absurdity. At one point, desperate to at least be considered a subject, our main character pulls a man off the street and gives him a stack of cash to enter a store and purchase about two dozen purple-ish neckties. He takes one, tells the man to keep the rest, and instructs him to take them to the local police station. He also tells the man that he is the killer of Augusta Terzi. Naturally, he then goes to the police station and confronts the poor man. Naturally, he is recognized, but the man immediately decides that he must be mistaken, and for his troubles, he gets arrested and is made a suspect himself. If there is a theme to Investigation of a Citizen Above Suspicion, it is that the old maxim that power corrupts is accurate. Our main character sets out to demonstrate this in the most terrible and blunt way that he can think of, and does everything he can to demonstrate that the power he holds can be used for tremendous evil because of its ability to corrupt not just him, but the people with whom he interacts. This film is absolutely subversive in the extreme, and that’s one of the things that makes it worth watching. That it’s also a sort of absurdist comedy is fascinating as well. With a change in the soundtrack, it would be nearly perfect. It’s as relevant now as it was when it was made. Why to watch Investigation of a Citizen Above Suspicion: It’s terribly subversive and completely relevant. Why not to watch: That soundtrack. Films are eligible for Foreign Film when they have been released in their home country, but they are eligible for all other categories when they are released in the US (which is not always in the same year). That makes sense, but it does create some weird realities in the listings. Just another technical twist in Academy rules. I suppose. It still leaves me scratching my head, though. I saw Investigation of a Citizen Above Suspicion at a revival house in Los Angeles with a very appreciative los Angeles film buff audience. I loved it! You're totally right that it's a dark comedy. And we'll have to agree to disagree about the soundtrack. I don't often remember much about soundtracks from films I saw once 15 years ago but I remember that the soundtrack for this film is wonderful, memorable and innovative. I didn't mind the score at first, but after half an hour, it started to grate on me. I'd have liked it better with something different.